Often in the playoffs, even the minor plays make quite the difference. That was ever more prevalent in game one between the Washington Capitals and the Tampa Bay Lightning. The Caps lost game one due to the little things the Lightning were able to accomplish. A lesson Tampa learned and carried over with them from the seven game win over the Pittsburgh Penguins. Bruce Boudreau alluded to what the press would decide on the result of game one. If the Caps won they would be rested, if they lost it would be considered rust. The later would be true. The Tampa Bay Lightning fresh off their series win over the Pittsburgh Penguins would put the Caps behind in the series by a game winning 4-2. Round two is set. The Tampa Bay Lightning will take on the Washington Capitals. The Lightning were down three games to one to the depleted Pittsburgh Penguins to win in game seven 1-0. What has been surprising about the Bolts win is they did it with their defense, a soft spot during the regular season. And having Dwayne Roloson in net didn't hurt either who has won 7 straight elimination games. The first round of the NHL playoffs had just about everything. And age old rivalry, some new foes in post season play and more game sevens than you can shake a hockey stick at. This is what the playoffs should be, right? Some games have been whoppers of games, while others have been snoozers. ﻿What appeared to be a rout, the team with the perfect record taking a lead into the third period looked poised to tie up the series at two games apiece. The New York Rangers and their fans seemed to finally get under the skin of head coach Bruce Boudreau and the Capitals. But the raucous crowd turned deftly silent when Jason Chimera chipped in the game winner in double overtime to give the Capitals a strangle-hold on the series with a 4-3 win. Playing desperation hockey, Brandon Dubinsky and the New York Rangers proved they could play close games too. Out working the Capitals, the Rangers claw their way back into the series thanks to a late third period goal despite the Caps rallying twice to tie up the game. They feel better about themselves and cut the Caps' lead in the series by beating them 3-2. In what would be their best period of the series, the Capitals scored a pair of goals while their net minder Michal Neuvirth came up with the shutout. The only response the New York Rangers could come up with was Sean Avery's antics with seconds left in the game. It would do little to prevent Jason Arnott and Jason Chimera from scoring to give the Capitals a 2-0 lead in the series. The only team the Capitals have beaten in post season play comes back for revenge. Two seasons ago, the New York Rangers were not considered contenders against a offensive powerhouse that were the Capitals in the first round. The Caps had won their second divisional title with more authority that season. But the Rangers found a way to hold on and force a game seven, in which they lost when Sergei Fedorov pulled up and shot a slapper high on Henrik Lundqvist to give the Caps their first playoff series win since in the Alex Ovechkin era. Now, fast forward to 2011. Two different teams from that moment in time. Alex Ovechkin can still prove to be dangerous in overtime. He recorded is franchise leading 11th overtime game winning goal in his career. It was a goal he would dance to as he defeated a team that may come to call in the post season in the Buffalo Sabres with a deflected shot that would sneak past Jhonas Enroth for the final score of 5-4. For Ovechkin it notches 30 goals for what will be a career low for the left winger as the season starts to wane. Mike Knuble would tally two goals while Alex Semin and Jason Arnott rounded out the scoring for the Capitals. It was a quick start for the Caps as they jumped out to a quick 2-0 lead in the first five minutes of the game. Enroth could not control John Carlson's shot on net and Knuble was there to clean up the rebound just :37 seconds into the game. Four minutes later, a similar play did in the Sabres as the shot was mishandled by their goaltender and Semin was on the door step to make sure the puck went in. But the lead didn't last long. The Sabres answered with a screened shot and a soft goal given up by Michal Neuvirth. Thomas Vanek and Drew Stafford would pull the game even before the game turned ten minutes old. After the flurry of scoring subsided, both teams seemed to settle in to play better defense and the game would remain scoreless through the second half of the first period, the second period and half way through the third. Paul Gaustad would score the tie breaker in the third period at the 12 minute mark putting the Sabres in the lead. That would not last long as the Caps roared back and answered with Knuble scoring his second goal off of a deflected Brooks Laich shot on the power play. The Sabres would make it interesting by scoring on their powerplay chance to take the lead back as Stafford scored his second of the game. Stafford's goal was the result of a pass that had been knocked in from a hard charging Carlson after the Caps turned the puck over on the offensive end. 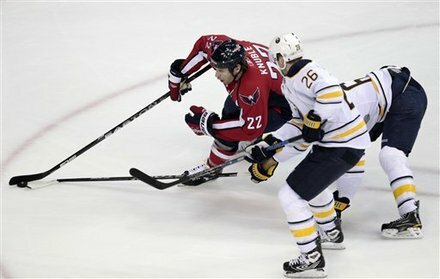 But the Caps get lucky in the dying minutes of the game as Gaustad was called for high sticking at 18:35. With the Neuvirth on the bench Jason Arnott, parked in front of Enroth, calmly reigned in a rebounded shot and back handed it past the Sabres' net minder to tie the game at 4 and force the overtime penalty. The charged crowd at Verizon Center erupted with Arnott's tally. Ovechkin would get the game winner on the same kind of bounce Stafford had scoring late in the third period. His pass would be deflected by a pair of Sabre defenders before finding the edge of the net just inches from Enroth's out stretched leg pad. The goal sealed the game for the Caps who take the season series from the Sabres 3-1 and prompted Ovi's dance. He would finish the night with three points (1g, 2a). Nick Backstrom played the strongest game yet this year. He would get the play-maker with three assists and add 4 shots of his own on Enroth. Semin had two points (1g, 1a), and Marco Sturm and Laich would each get an assist on the night while defenseman Carlson had a pair of assists. The Caps showed some brilliant resiliency against a desperate team trying to keep themselves in the playoffs. The game had a tension to it similar to a playoff game, a good test for both teams. There was a lot of ebb and flow to the game for both sides as each team seemed to have the answer to the others goals. 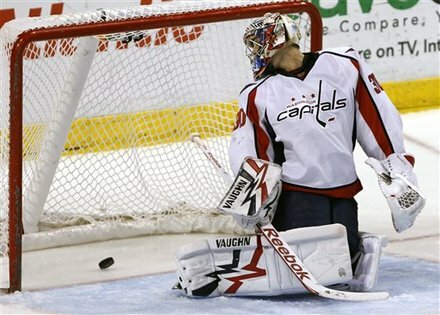 The Capitals are limping into the post season as they deal with injuries down the stretch. Sean Collins was recalled from Hershey to boost the blue line as John Erskine sat out with what was called a "minor" injury. Even with a depleted D core, the Caps defense soldiered on. The schedule winds down with a pair of road games, one against Toronto. The other is part of a final home and home with the Florida Panthers before the Caps close the book on another 82 game season.